If you've seen Dan Boeckner perform in one of his 472 different bands of note (okay, it's really only about four or so), you're probably used to seeing him sporting his yellow Telecaster guitar. And the guitar certainly had its moments during his first Halifax performance with Operators, his new band with Devojka and his Divine Fits drummer Sam Brown. But it started the show tucked in the corner, with Boeckner, clad in a tight black blazer, in full-on frontman mode. Opening with "Ancient" from the band's debut EP, Boeckner took to the front of the stage to sing, his nervy, twitchy energy buckling his knees with each beat. 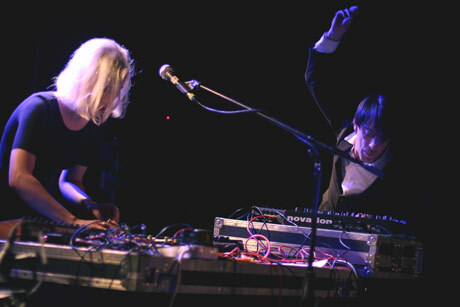 Unlike Devojka, whose movement between her various audio manipulators is fluid and smooth, there's nothing remotely graceful about the way Boeckner's starts and stops pull him from his microphone to his keyboard and back, and it's a perfect fit with his jittery and sharp vocal style — his songs that are far more invested in what happens on the beats than in the space between them. All of which is to say that Operators are a continuation of the same endearing songwriting ticks that Boeckner brought to Wolf Parade, Handsome Furs and Divine Fits. Yet I was somewhat underwhelmed by Operators' debut EP, and hearing the songs live made me realize why. On the record, the drums seem to be aiming for some sort of cold, electronic precision, but Brown (who also drums for New Bomb Turks) brings them to life on the stage. He offered force worthy of Boeckner's twitches both physical and musical, and the crowd responded by dancing along until the house lights came up.